Yesterday I took Awngate a short trip down the coast to Littlehampton for the SWING industrial and narrow gauge show. I was ably assisted by my chief train driver. We did suffer some problems with the fiddle yard, the wiper contacts are not working too well. I may have to re-think that, but I don't yet have a better solution. 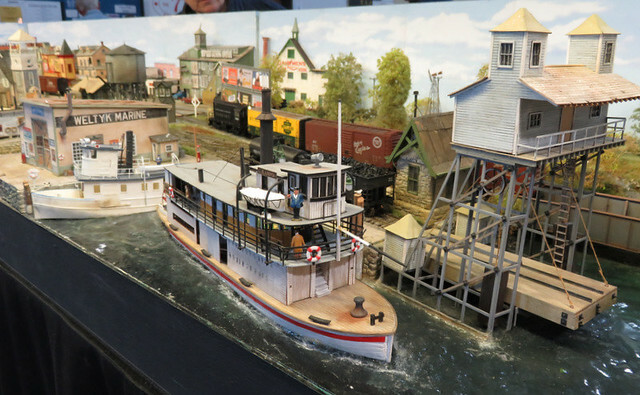 There were also the few troublesome trucks, but mostly the layout performed well, and received some nice comments. The show was at a new venue, the Littlehampton Academy, which meant all the exhibits were in the same hall, a big improvement over the last venue I thought. The style remained the same, a varied collection of layouts covering narrow gauge and industrial themes - though there was even an Irish broad gauge layout - and good trade support including NG specialists and both 009 Society and 7mm NG Association society sales. I did get a few photos although unfortunately I didn't get a program or list of layouts, so I don't remember the names or builders of most of them. 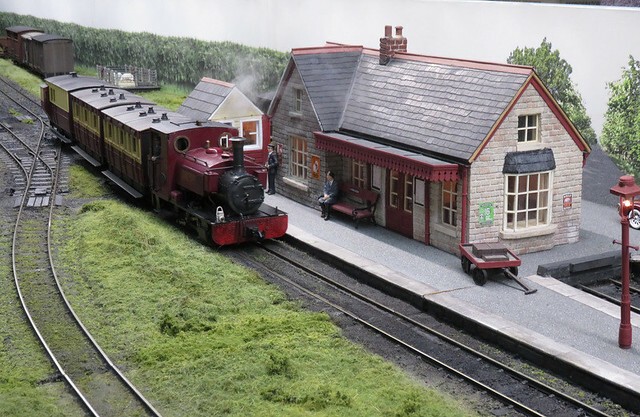 Both the trophies - voted for by exhibitors, and by visitors - went to this live steam SM45 layout Hambleden Valley Railway. Most live steam layouts are all about the trains with some token scenery, but this was a detailed scenic model railway that happened to use actual steam power, running was smooth and realistic by radio control too. I guess you could say it is more prototypical than most layouts. 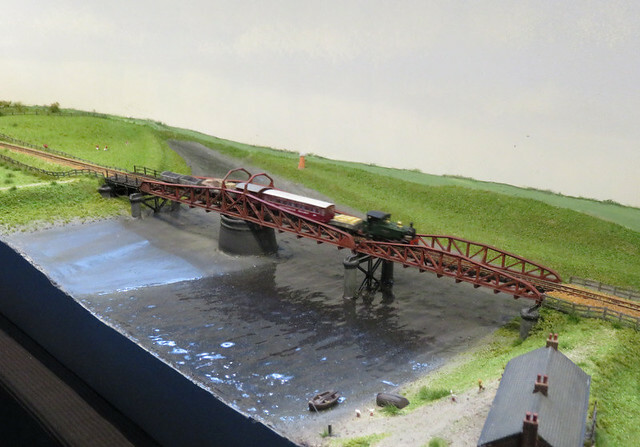 Bridge over the Blythe is a model of the Southwold Railway prototype, and a fine example of railway in the landscape modelling, it's hard to believe this is 2mm scale. I liked this US industrial layout, Red Hook Bay, full of finely detailed scenes and the waterfront is superb. Another type of waterway, this canal lock on this 7mm scale layout called (I think) Mulldale. More photos can be found on Flikr here. My armoured simplex, which I built a couple of years back, didn't run very well. Investigation showed that the sleeve on one of the axles had come loose from the axle, meaning the gear could turn on the axle, effectively making it a 2 wheel drive chassis. The sleeve is meant to be superglued in place but it is very difficult to do, and even more difficult to fix, as the axle also has to pass through the chassis holes. 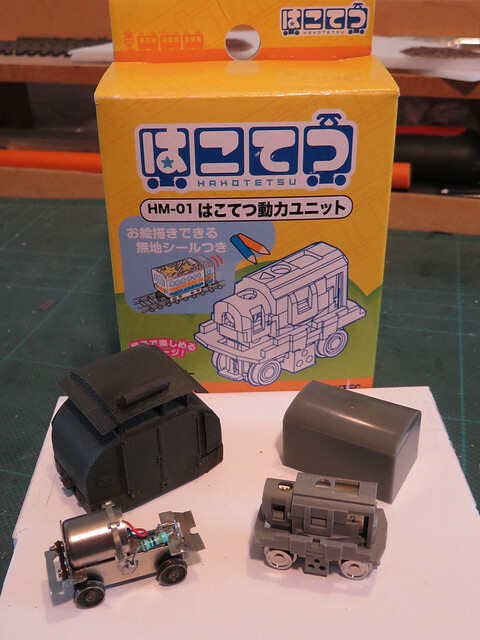 Since I can't figure a way to fix the chassis without supergluing it I wasn't sure what to do, until I heard that the Tomix MH-01 chassis can be fitted. 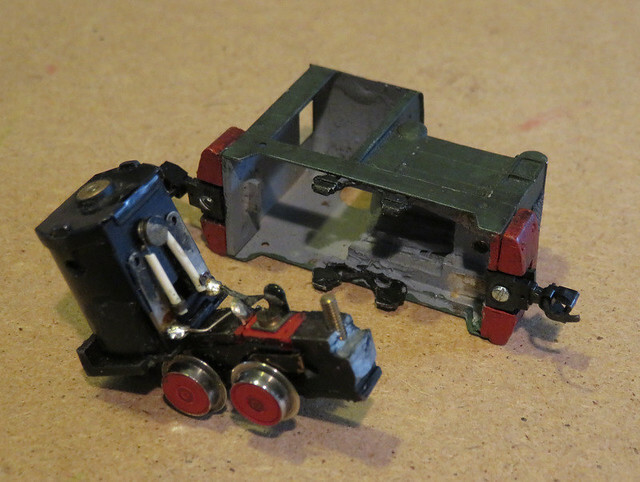 So at Narrow Gauge South I picked up a chassis, as you see it comes with a bright but incomprehensible (to me) box. It also has a "box-van" style body to fit over it, and stickers to cover it which you can decorate, though I didn't use those. Under the toy-like packaging and body is a surprisingly compact chassis. Oddly, it has a frame like a kind of life-ring mounting around it, which is designed to allow some movement - limited rocking and swivelling - of the chassis within it. I cut a piece of 40 thou plastic (black) to fit within the body of the simplex, and out of that cut the shape of the chassis until it until it was a close fit around the outer frame of the chassis. 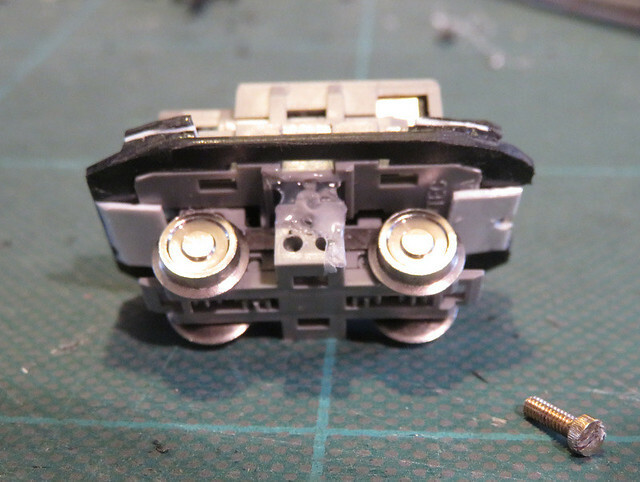 Small squares built up on packing pieces sit on the corners of the chassis, and smaller off-cuts bear against the side of the motor to prevent it swivelling within the frame. At one end I made a notch for the mounting bolt. Underneath a couple more pieces of plasticard clamp under the chassis outer frame. There was still a little movement between the chassis and mounting frame, so I dabbed a spot of hot glue in the gap on each side. The chassis is a neat fit into the body. 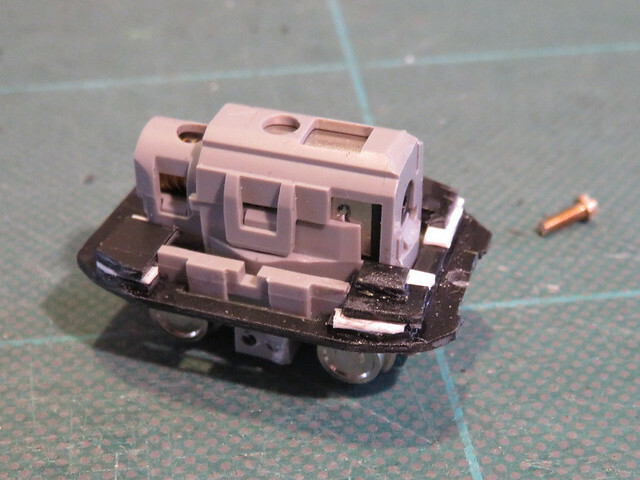 The new mounting plate slots in at one end, held by a plasticard piece behind the buffer beam. At the other end it is held by the bolt used for the original chassis. I couldn't find space to secure the couplings with a screw so I've had to superglue them in pace, fortunately there's a nice piece of whitemetal just above them to there should be plenty of contact. I'm pleased to say the new chassis runs well, and it's nice to have the little tin turtle back in service. However I'm still left with the problem of how to fix this Ruston, also languishing out of service. The Minitrix chassis motor has taken to releasing magic smoke every time power is applied, so it looks like it is mortally wounded. It's a difficult chassis to replace though.